One of the UK’s biggest suppliers of building materials – Jewson – has been accused of raising the price of its sandbags to profit from the recent flooding. Several of my own requests to Jewson to either confirm or deny the accusations have been studiously ignored. If they don’t get their heads out of the sand soon and tackle these accusations – Jewson could be facing a storm of their own. 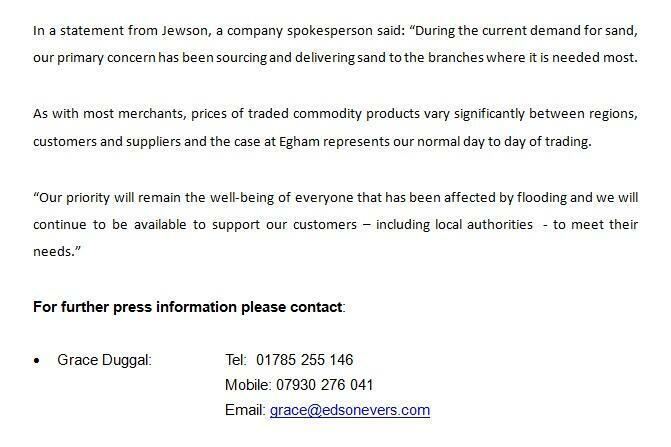 One that could end in a damaging boycott by angry customers of their shops once the flooding crisis is over.